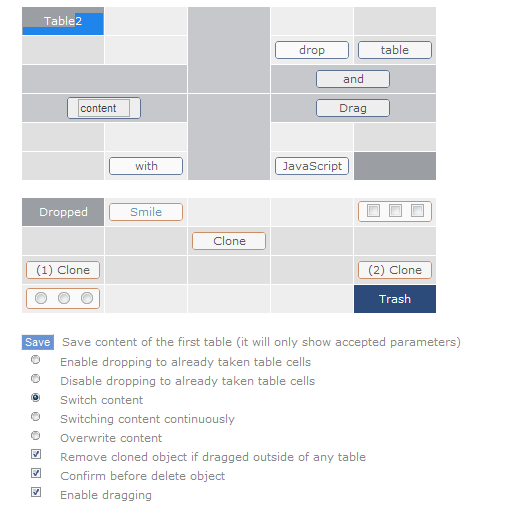 Content of HTML table cells can be dragged to another table cell or another table. It isn't difficult to define onMouseMove handler and change top / left element styles to move the object. In case with tables, you will have to determine somehow destination table cell. Attaching onMouseOver handler on table cells will not work, because browser doesn't fire events to the elements beneath the dragged object. Anyway, after taking care of the current scroll position and calculating table cells positions, here is example that should work in FF3, IE8, Google Chrome, Safari 5 and Opera 11. Please try to drag green, blue or orange bordered DIV elements, change properties (radio button and check-boxes) and click on "Save" button. "Save" button will scan tables, create query string and send to the PHP page. Demo shows how to collect table content and accept parameters on the server side. More about accepting parameters you can read in my post Reading multiple parameters in PHP . "Clone" elements (orange in this demo) will be duplicated first because of "clone" keyword contained in class name. If you drop object on cell named "Trash", object will be deleted from the table (with or without confirmation). Script has built in autoscroll and option to forbid landing to non empty cells or cells named with class "forbid". Table can contain rowspan / colspan cells and different background color for every cell. Script will search for div elements (with class name "drag") inside tables closed in <div id="drag"> and attach onMouseDown event handler. When user clicks with left mouse button on div element, onMouseMove and onMouseUp handlers will be attached to the document level. While dragging div element, script changes "left" and "top" styles of the object. This is function of the onMouseMove handler. When user releases left mouse button, onMouseUp event handler will unlink onMouseMove and onMouseUp event handlers. This way, browser will listen and process mousemove events only when user holds left mouse button on div element. As I mentioned, onMouseDown is defined on the elements you want to drag. Elements beneath the dragged object will not be able to catch onMouseOver event. Why? Because you are dragging object and that object only can catch the onMouseOver event. So, to detect destination table cells, script calculates all table cell coordinates (with scroll page offset) and store them to arrays. Arrays are searched inside onMouseMove handler and after left mouse button is released, object will drop to the current (highlighted) table cell. In redips2.tar.gz (54KB) package you will find 15 examples including example of how to save/recall table using PHP and MySQL. Package also contains and redips-drag-min.js, a compressed version of REDIPS.drag library.